Spyder is a popular open-source Python IDE, and it’s bundled in with Anaconda by default. 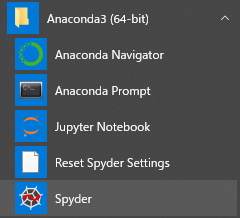 To launch Spyder, go to Windows menu, select Spyder inside Anaconda3 menu. Spyder allows plugins to be installed to add extra features to itself. Spyder plugin for modelx enriches user interface to modelx in Spyder. The plugin adds custom IPython consoles and GUI widgets for using modelx in Spyder. For more about Spyder plugin for modelx, refer to Spyder plugin page on modelx documentation site. lifelib models are built in the form of modelx objects. Refer to modelx documentation when you have questions about modelx as you proceed with this guide. To learn Python itself, there are many good tutorials out there on the web, such as the one on Python’s official web site. There are 2 Spyder settings that you want to consider changing from their default values. Note that you need to restart Spyder to bring your changes into effect. Reloading modelx module creates multiple instances of modelx systems within the same Python process, causing models created before and after a reload to reside in different modelx systems. To prevent this, you need to change User Module Reloader (UMR) setting. By defult, Graphic Backend option is set to Inline. This option affects where graphs are placed, and how modelx GUI widgets behaves. If Graphic Backend is set to Inline, graphs are embedded in the IPython console as an output. If it is set to Automatic, graphs are drawn in separate windows, which pop up upon calling plot methods on matplotlib objects. If you’re fine with the default Inline mode, then no need to change anything. 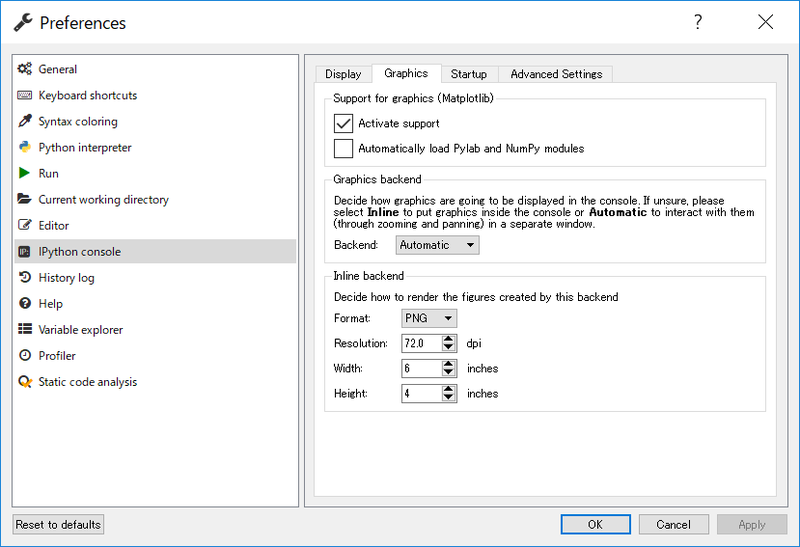 To change Graphic Backend option, go to Tools->Preferences, and on the left side of the Preferences window, select IPython console then Graphics tab on the right pane. Building a model is a process to construct a Model object in a live Python session from script and source files in your project folder. By default, you have a project module in your project folder, which has the same name as the project name, such as simplelife.py. 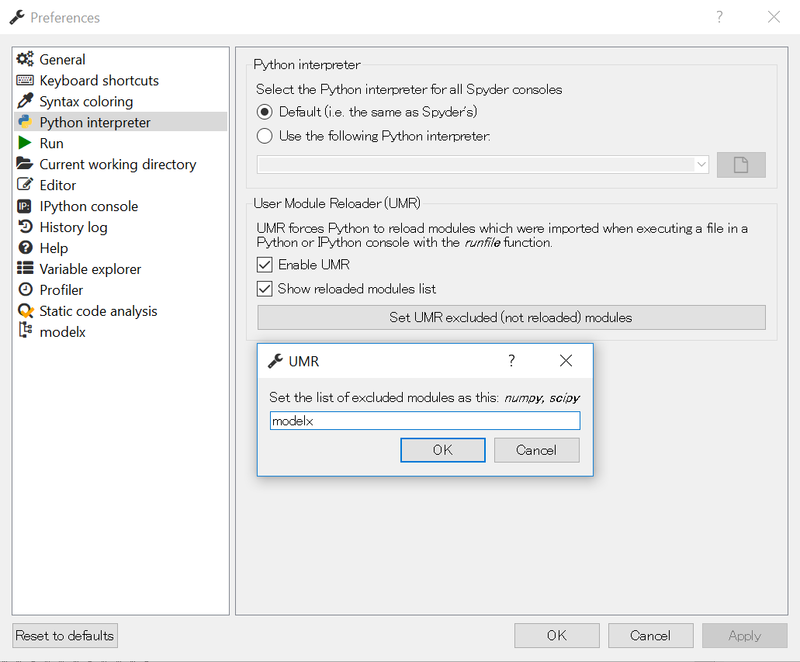 To build a model, import the project module into a Python session and call build function in the module. Let’s see how this can be done in Spyder. First, Show MxExplorer and MxDataView as instructed in Spyder plugin page, and make sure a MxConsole is the active IPython console in the IPython widget. Instead of directly typing the code in the console, you can create a Python script in your project folder, write the code in the script using Editor pane on the left side of the window, and Run it by clicking the green play button in the tool bar. The script is executed in the MxConsole. After model is built successfully, The objects that compose model object are shown as a tree in the MxExplorer. By selecting a space in the MxExplorer and right clicking and selecting Show Formulas in the context menu, the formulas of the cells in the selected space are listed next to the model tree in the MxExplorer. By default, simplelife model is set up for you to carry out projections and store results by policy under Projection. The attributes of the sample policies are defined on PolicyData tab in Input.xlsm. You can see under Dynamic Spaces under Projection space, a space for policy No. 1 (PolicyID=1, ScenID=1) is created. Pandas is a widely-used data analysis library for Python that provides feature rich data types for data manipulation, such as DataFrame. To see the contents of df the DataFrame object we have just created, bring up Variable explorer tab on the top right side of the Spyder window, then click on df row. There are many Pandas tutorials and books out there for you to learn how to slice and dice the data as you like. Another way to view data in a tabular form is to use MxDataView from Spyder plugin for modelx. The expression is re-evaluated every time a command in MxConsole is executed, so the data in table is always up to date. By default, the project folder also contains sample scripts. Files whose names start with plot_ are the sample scripts that are on Gallery of Examples pages. Let’s run a sample script to draw a graph of liability cashflows. In Spyder, open plot_simplelife.py file in the project folder, from File menu or from File explorer and Run it. The grpah below shows up in another window. After execution of the script, the session will move to interactive mode. The session is available in an IPython console in Spyder for you to interface with the created model.